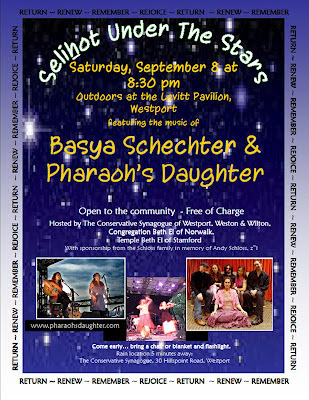 The Conservative Synagogue of Westport, Weston and Wilton, in collaboration with Congregation Beth El of Norwalk and Temple Beth El of Stamford, are co-hosting a special service under the stars at the Levitt Pavilion in Westport on Saturday, Sept. 8, at 8:30 p. m. Headlining the program is a special musical presentation by highly acclaimed artist Basya Schechter and her band Pharaoh's Daughter. The band, Pharaoh's Daughter, is described as "a blend of psychedelic sensibility and a pan-Mediterranean sensuality, through swirling Hasidic chants, Mizrachi and Sephardi folk-rock, and spiritual stylings filtered through percussion, flute, strings and electronica." The sound has been cultivated by Schechter's Hasidic music background and a series of trips to the Middle East, Africa, Israel, Egypt, Central Africa, Turkey, Kurdistan and Greece. The clergy from all three synagogues will be officiating at service: Rabbi Jeremy Wiederhorn and Cantor Laura Berman of The Conservative Synagogue of Westport, Weston, and Wilton; Rabbi Joshua Hammerman and Cantor George Mordecai of Temple Beth El of Stamford; and Rabbi Ron Fish of Congregation Beth El of Norwalk. "Throughout the High Holiday season, we gather with our respective communities under the roof of our synagogue buildings. 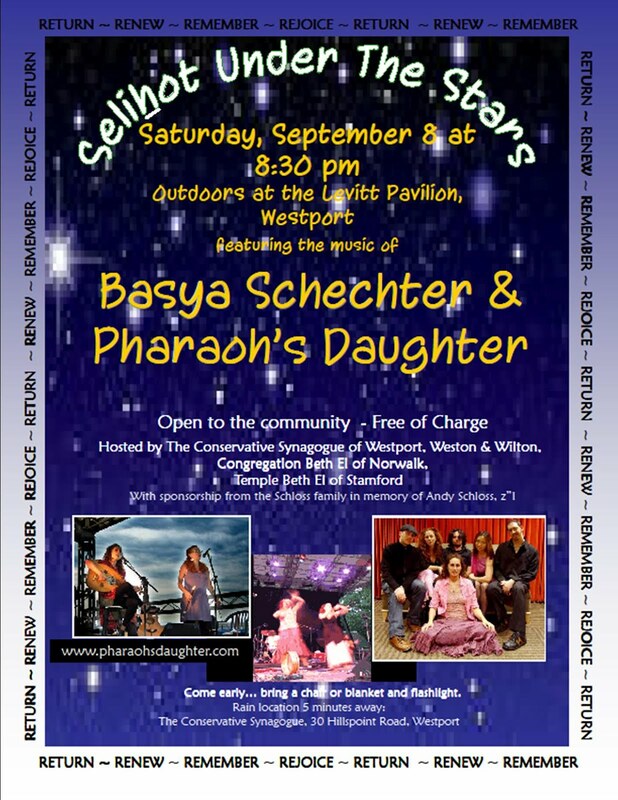 This year we decided to join together with the larger community `under the stars' as we usher in the Days of Awe with a special musical Selichot experience," Wiederhorn said. "This collaborative effort in a spectacular venue should make for a spiritually moving evening." Selichot are Jewish poems and prayers for forgiveness traditionally recited in the period leading up to the High Holidays (Rosh Hashanah and Yom Kippur). 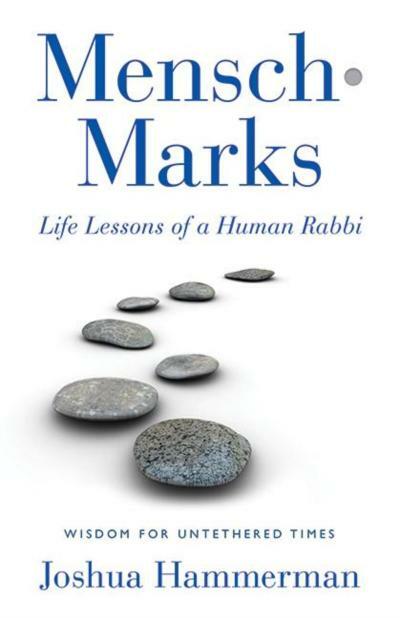 As the Jewish month of Elul draws to a close, the mood of repentance becomes more urgent. The first Selichot service of the holiday season is typically a large, community service held before Rosh Hashanah. "I'm thrilled that our three Conservative congregations will be coming together in celebration, reflection and song, marking a new phase in the growing connection between the Jewish communities of Fairfield county," Hammerman said. "This sacred season is a time for individual reflection, for families to come together and for our various communities to swell with worshippers," Fish said. "What makes our area so special is that we also have the opportunity to join together with our fellow Conservative synagogues throughout Fairfield County to share our common goals and dreams for the coming year." The event is sponsored, in part, by members of The Conservative Synagogue, the Schloss Family in memory of their son, Andrew Schloss, a columnist and sportswriter for The Wilton Bulletin. He died in 2008 following a seven-month battle with leukemia. He was a resident of Wilton.